A new incremental update has been rolling out for the OnePlus 2 for it’s remarkable Oxygen OS that comes as a stock firmware for the device. Following the version 2.1.2, the Oxygen OS has now been updated to v 2.2.0 with some stability improvements and bug fixes. One of the major fixes is the dual SIM selection issues in the settings. Here we are with the incremental OTA update for Oxygen OS that can be manually installed on your device. First go to Settings>About Phone> Tap the Software Updates option and check for updates. If you have not received the update over the air, then follow the instructions given below and your device should be updated. 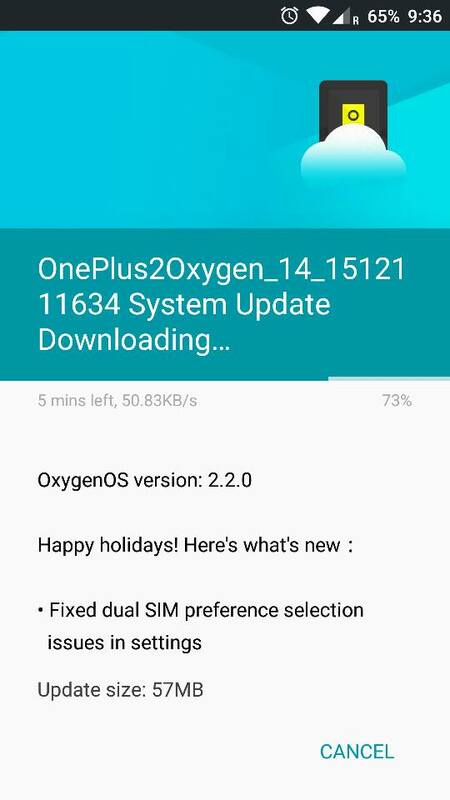 Currently, OTA update for Oxygen OS 2.2.0 is available and the full ROM zip will be updated soon. Make sure that you have the v2.1.2 as your base firmware number. Once you have that you are all set to apply the updates with stock recovery. Step 1. Before you proceed, make sure you have installed the base update prior to v2.2.0. That means make sure you have Oxygen OS v2.1.2 as you current firmware version. Step 2. Now download the Oxygen OS 2.2.0 OTA zip file from the downloads and transfer it to your phone’s internal storage. If this procedure fails for you, then you can try the TWRP method. However, you will need the full ROM file and not just the OTA zip file. If you happen to choose the second method given below, then a backup is highly recommended as going through this process may remove all your apps, data, system and more. Though it won’t remove internal storage. Hence, a backup or Nandroid backup is highly recommended. Go through this process only if you have a full ROM. Incremental OTA may not work with this. Take a look at the requirements given below. 1. Verify your device before you proceed. The listed Oxygen OS is compatible with only OnePlus 2. Step 1: Download the latest Oxygen OS Full ROM zip file from the download section. Step 5: This step is optional. However, you may need to wipe system and data if the ROM doesn’t update. Now wipe the current system. To do so, return to home screen and tap the Wipe option in TWRP. Tap Advanced Wipe and select partitions like system, boot, data, cache, dalvik cache. Do not in any case select internal storage, unless you know what you are doing. Step 11: Once you reboot, you should see the logo. This means that the ROM has been installed successfully. First boot may take a while. If the ROM doesn’t boot or you come across boot loop, a factory reset from the recovery should do the trick. If that fails, you can restore your previous ROM from the TWRP recovery.